BLACKSBURG, Va., Sept. 26, 2008 – A diary written by Virginia Tech's first president is the latest addition to the Virginia Tech Libraries. Charles Landon Carter Minor, president of the Virginia Agricultural and Mechanical College from 1872-1879, kept the diary while he served as a captain in the Confederacy during the Civil War. The diary also served as Minor’s account book from November 1860 to May 1864. He used it to record numerous cavalry expenses, such as a sword belt, gun sling, and horse shoes. 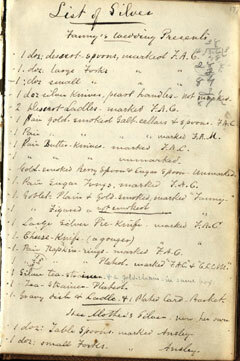 It also contains information on other matters such as a detailed list of his wife’s wedding silver. The diary was then acquired by a Union soldier and musician, Edward P. Harmon. Harmon wrote “Taken from the trunk of a Rebell [sic] Captain at Hewlett’s Station on the Virginia Central Railroad May 25th 1864.” Harmon used the diary as his own, recording his experiences at the Battle of the Wilderness, Spottsylvania, North Anna River and Cold Harbor. With help from its George R. Wallace Foundation Endowment for the Newman Library Special Collections, the Virginia Tech Libraries acquired the diary from Swann Galleries during an auction on June 5, 2008. Records from Minor’s presidency at Virginia Tech were destroyed in a fire, so this diary serves not only as an important tie to the university’s first leader, but also a remarkable specimen of Civil War history from both Confederate and Union perspectives. The diary will be on exhibit at Newman Library during October 2008 in the Special Collections Reading Room on the first floor of Newman Library and is available for research use immediately. A member of the Association of Research Libraries, the Virginia Tech’s University Libraries provide and promote access to information resources for the achievement of the Virginia Tech’s objectives in teaching, learning, research, creativity, and community service. The University Libraries are dedicated to meeting the information, curricular, and research needs of students, faculty and staff of the Virginia Tech community, wherever located, in a manner that respects the diversity of community and ideas.